The Spring Loaded Linear Variable Differential Transformer Sensors are offered with stainless-steel probe assembly and 3/4 in. diameter hermetically-sealed housing. The units can be operated in environments with dirt, water, vibration and temperatures range of -65° to 220°F. They are suitable for applications such as go/no-go measurements, automotive part quality testing, roller position/product thickness control and TIR measurements. The LVDT sensors are available with gage heads in 1.27 mm to 50 mm range. Pennsauken, NJ, December 11, 2018… NewTek Sensor Solutions offers an extended series of spring-loaded LVDTs that provide accurate dimensional feedback for a variety of position measurement and quality assurance applications including go/no-go measurements, automotive part quality testing, roller position/product thickness control, TIR measurements and material testing under stress. Designed with a stainless-steel probe assembly and ¾” diameter hermetically-sealed housing, these spring-loaded sensors operate in challenging environments with dirt, water, vibration and temperature ranges of -65° to 220°F while providing highly accurate position measurement with maximum linearity of +0.25% of full-scale output. New Tek offers AC- and DC-operated versions of its gage heads in ranges from ±0.050 in. to ±2.00 in. (1.27mm to 50mm). With electronics built into a spring-loaded assembly, DC-operated units do not require external electronics, reducing installation time and costs. AC-operated configurations can withstand higher temperatures and provide a variety of analog or digital outputs when connected to an LVDT signal conditioner such as NewTek’s NTC Qwik-CAL™ Signal Conditioner. NewTek offers customized options for its spring-loaded LVDTs including extended temperature ranges up to 400°F (200°C), mild radiation resistance to 30 MRad, air extend probes and custom spring rates. 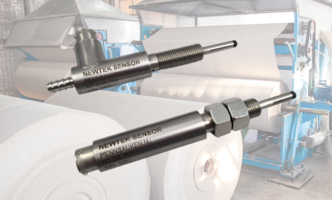 For more information, refer to http://www.newteksensors.com/spring-loaded-lvdts/ or contact Mike Marciante at 856-406-6877 to discuss your application requirements.